Welcome to 3DTechTalks where we keep you up to date on all things 3D Printing (or Additive Manufacturing for the purists out there)!! 3D TechTalks - Metal 3D Printing: Issues and Aerospace Applications. Applications for metal 3D Printing or as it is sometimes called - Metal Additive - are growing rapidly across many manufacturing sectors. One of those sectors where Metal Additive is - and will continue to have - an enormous impact is aerospace. Melanie Lang, co-founder of Metal Additive provider #Formalloy, is someone at the very heart of these changes. Melanie took the time to talk with 3DTechTalks about the benefits and challenges of metal additive as well as her thoughts on where the industry is now and where it's going. Melanie will be giving a talk on this topic "Metal Additive Manufacturing for Aerospace Applications" on Tue. February 5 at 2:00 PM at the #PacificDesign&Manufacturing Conference. Thank you Melanie for taking the time to talk with 3DTechTalks! Dr. Behrang Poorganji is Director of Materials Technology at GE Additive. 3DTechTalks will be introducing Dr. Poorganji at The Pacific Design & Manufacturing Conference in Anaheim CA on February 5th. Dr. Poorganji's presentation goes right to the heart of what the driving force is in the industry. It's about the materials! The more material diversity, the more widespread the applications, the more widespread the applications, the faster the rate of adoption of additive technologies. Big thanks to Dr. Poorganji for taking the time share his insights on this very important topic in 3D Printing. There are so many aspects to 3D Printing. The new developments in materials make news. The new printers that are coming out make news and of course the exponentially expanding applications of 3D Printing make headlines everyday. But a topic that too often gets overlooked is what are the business implications of 3D Printing? Whether you're a CEO, a company president or someone in senior management, how do these developments impact the decisions you have to make in the coming years. These decisions include prototyping, production, tooling, support and - perhaps most intriguing - supply chain. In this interview we talk with Cathy Lewis, former CMO for 3D Systems, and Dayton Horvath, former Lux research analyst in the industry and consultant on 3D Printing strategies to talk about how new materials and machines will impact many business functions including the supply chain. What are Digital Tools?? What do Digtal Tools have to do with 3D Printing? What are Digital Tools and what do they have to with 3D Printing? More importantly what do they have to do with the future of your business? Listen to our talk with Xiao Zhong, Analyst at Lux Research, about these important trends in Additive Manufacturing. Then reach out to 3DTechTalks.com about how to implement these important changes to keep your business competitive. There are a lot of questions about 3D Printing in metal with new technologies, materials and applications happening almost daily. Join us for our conversation with Matt Sands, CEO of 3DEO as we talk about their unique approach to Metal Additive and how they differ from the other 3D technologies. Generative Design & 3D Printing - Two Technologies That Go Together Like Ketchup and Hamburger. Generative Design and 3D Printing are two completely separate technologies that complement each other perfectly. In the years ahead the adoption of generative design to product design will drive the adoption of 3D Printing which will in turn drive more generative design. Dr. Michael Bogomolny, Phd, CTO and co-founder of Paramatters talked with 3DTechTalks about this perfect pairing and how the Paramatters software CogniCAD will aid engineers and designers in creating more efficient designs that lead to better performance. I will be introducing Mike at the The Pac Design and Mfg Conference in Anaheim from February 5th - 7th for his talk Making Generative Design Your New Asset - The Current Benefits & Future Value of This Emerging Practice. Jennifer Campbell brings together great speakers on important topics in 3D Printing for industry trade shows like the Pacific Design & Manufacturing Conference in Anaheim CA from Feb 5 - 7. Listen to our interview talking about what she's seen the past couple of years coordinating these events and what to expect at the Pac Design event. 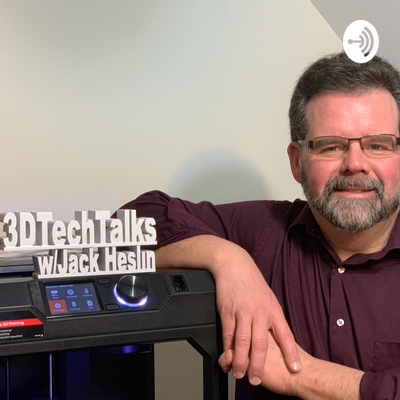 3DTechTalks is the podcast series devoted to keeping our listeners up to date on all things related to 3D Printing (or for the technical purists out there - "Additive Manufacturing". We'll be discussing the technologies, materials, use cases and most important of all, what does this all mean in the coming years. So join us every Monday, Wednesday and Friday as discuss this fast changing industry and the impact it will have on us all.